What do your professional bio and the Mona Lisa have in common? Right now, perhaps nothing. However, did you know that this famous painting is only 2’6” x 1’9”? Your bio, though slight, can be as memorable. 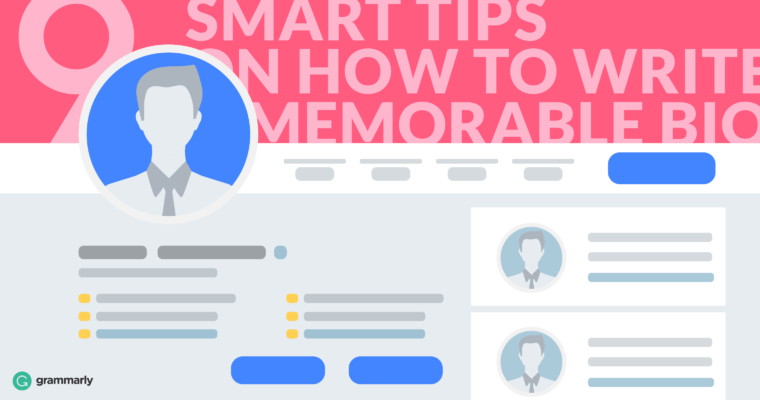 Here are nine smart tips to get you started. Most publishers, including websites, have guidelines for bio writing. For instance, the Indiana University Press allows you to mention only one type of publication—books. Before you begin, consult each organization’s submission guidelines. Don’t even think about pasting the same old bio everywhere. In addition to differing requirements, each publication or site has a distinct purpose and audience. Your bio should reflect knowledge of the platform and highlight the aspects of your background that would most appeal to its readers. Your Twitter bio, for example, may be both more promotional and playful than a bio on your company’s website. According to the Huffington Post, you have less than twenty seconds to grab the attention of an average reader. The first line shouldn’t drily state your name and how many years you’ve been writing. Below, Erik Larson’s bio leads with an outstanding achievement. Barbara Park’s draws attention to the comedic nature of her novels. How can you start your bio off with a bang? Erik Larson is the author of five New York Times bestsellers, most recently Dead Wake: The Last Crossing of the Lusitania, which hit #1 on the Times list soon after launch. Barbara Park was best-known as the creator and author of the New York Times bestselling Junie B. Jones series, the stories of an outrageously funny kindergartener who has kept kids (and their grownups) laughing—and reading—for over two decades. If you’re limited to a few lines, like on a Twitter or Instagram profile, make those sentences count. Build as much relevant information as possible into one statement. Compare the first (fake) excerpt, which wastes space stating the person’s name and what they do, and the second (real) excerpt, which skillfully merges those details to create a concise statement. Mark Levy now works at Levy Innovation. Previously, he worked as a Chief Marketing Officer for a branding company. Before devoting his work full time to Levy Innovation, Mark [Levy] served as Chief Marketing Officer at an Inc. 5,000 experiential branding organization, whose clients include Bank of America, Gap, Samsung, Time Warner, Tivo, and Harvard and Stanford Universities. 5. Choose carefully between first or third person voice. The choice of first- or third-person voice depends on your platform and audience. If you are writing on your personal blog, for example, first person may be most appropriate. On the other hand, most formal journals feature third-person biographies. Extremely informal biographies use implied first person—without mentioning your name or the “I” pronoun. 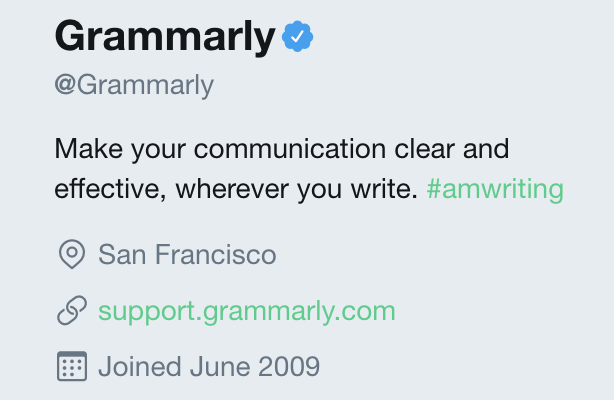 First person: I am a contributor for Grammarly. I have 15 years of experience in writing and editing. I love my dogs. Implied first person: Contributor for Grammarly with 15 years of experience in writing and editing. Dog person. A bio is an opportunity to tell the audience why they should trust you. Select your most impressive educational accomplishments and experience, but make sure that they are relevant to the topic. For example, don’t list your master’s thesis about medical pathology if you’re writing a biography about your new career in marketing. The reader should trust that you know what you’re talking about by the end. 7. Make sure your words complement your picture. You know how many words a picture is worth, right? If you’ve gone through the trouble of hiring a professional photographer to shoot a headshot, your words should match up. Do your words make you appear as likable, authentic, and warm as your photograph? If the answer is no, you have revising to do. The objective of an author’s bio is not only to help readers get to know you. You want the reader to know where to find more of your work. So, tell them where they can find it. After all, social media sites drive 31% of all website referral traffic. Adding a hyperlink to your Twitter profile, website, blog, or marketplace is a smart way to gain exposure. 9. Show readers what’s in it for them. Okay, the opening statement was an exaggeration. Your author’s bio will never be as famous as the Mona Lisa. But your bio can be a masterpiece of its own. Which tip will you try first?